This is the time of year when any health club worth its mortgage is advertising: "Tune Up Your Body for the Ski Season, Enroll Now!" Most people who belong to a health club are in such good shape that they don&apos;t need that extra tuning up just to drive three hours to stand in a lift line. And for those of you who don&apos;t belong to a health club, it&apos;s already too late to join to get in shape for this season. Right about now, large groups of the needing-to-get-rid-of-the-flab crowd congregate at sport bars. They&apos;re drinking toasts to the passing of the bikini-watching-or wearing-season. 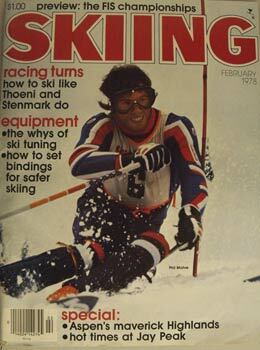 They used to look forward to watching attractive people skiing in stretch pants. But skiers today wear clothes so baggy they look like a sack of cats on the way to the river. "It&apos;s time to get fit for the ski season. Or, then again, you could just move to Michigan." By the way, never talk to anyone about losing weight. All I ever hear about is the 12 pounds that a friend lost while he was on a diet of cabbage and beets for three months and working out three times a week with a personal trainer who charged $100 an hour. The only thing that much exercise will get you ready for is to die healthier. There are all types of exercises that will get you in shape for skiing. There are those you can read about in magazines, there are thousands of different get-in-shape videos, there&apos;s soft aerobics and hard aerobics, yoga, Pilates, push-ups, sit-ups and jogging. But most people train by remote-control channel surfing. If you have good hand-eye coordination, a precise mental time clock and a capacity for remembering numbers, you can click from one sporting event to another and miss every commercial during a weekend of football. Regardless of which exercises you do, you have to determine what being in shape means to you by comparing yourself to others. At Boyne Mountain in Michigan, which is a little over 400 feet high, I have heard people standing at the top talking about where they should meet on the way down. "Halfway, by the big pine tree," seems to be the most common place to stop, rest and talk about how the run has been so far. In their own minds, every one of these skiers is in great shape. At the other end of the spectrum is Chamonix, France, where two gondolas rise 10,000 vertical feet. This is a place where the locals think nothing of skiing nonstop from top to bottom. The first time I skied there, almost 40 years ago, I rode up on a construction tram, which consisted of a platform about the size of a sheet of plywood. James Couttet and I balanced each other on either side of the platform as we rode up. On the way down, I probably stopped 45 times to take movies of almost every turn the former world champion made. I also stopped a lot of times because I was tired. I was in better shape then than I am today, because I was 4 decades younger. My mind is still willing, but my body isn&apos;t. However, being a 14-year-old kid trapped in a senior citizen&apos;s body is still better than the alternative. And now, if you&apos;ll excuse me, I have to go and start my first workout of the season. There&apos;s still a lot of time left to get in sufficient shape to do more than three sit-ups at a time. Then I&apos;m grabbing my skis and boots—and heading straight to Michigan.